Journey to the Hidden Mountain by Victoria Heales is a fantastical tale that begins when young Violet spots what she believes is a colorful stone. When her older brother, Jude, almost steps on it, he realizes that it is an egg. They bring it into the house and when it heats up and light begins to seep out of the cracks, it hatches into a baby dragon that loves to eat jam. The two youngsters name the little dragon "Toast," and keep him hidden until he gets too big to keep as a secret any longer. Their parents get introduced to him and quickly adopt Toast, to the delight of the children, and he becomes the family pet. After a while, Toast stops growing and he is just big enough to ride. When Jude and Violet mount him, they are whisked away on an adventure where they meet fairies and other magical folk of legend, including more dragons, and Tyberias, the Evil Emperor dragon that has set his sights on humankind. Ms. Heales does an amazing job of bringing this magical tale to life, creating a world that is inhabited by the dragons that have been hiding for too long. Violet and Jude begin rallying their new friends to rescue their beloved Toast from the depths of Kaiju Lume Mountain. But will they be able to succeed against Tyberias? The characters are very real, and the reader is willingly pulled into a world of wonder with great characters. 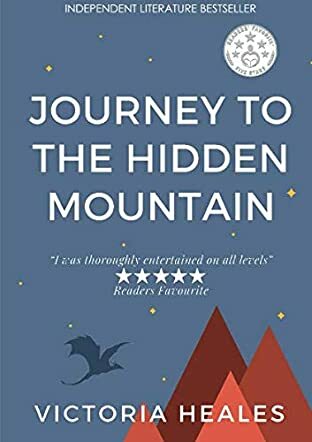 Journey to the Hidden Mountain is a fast-paced story that will definitely capture the attention of the targeted reader age group, but also that of anyone reading this fast-paced adventure. I was thoroughly entertained on all levels. Victoria Heales is able to paint vivid pictures that really bring this story to life with her words. Brava! Well done!